Dr. Milind Inamdar heads Supply Chain at Narayana Health with the key responsibilities of reducing the cost of procurement and driving inventory efficiency. 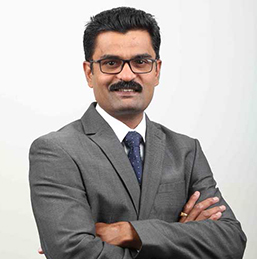 He joined Narayana Health in 2002 as a Manager and executed the plan of setting up the hospital’s purchase and inventory department. Over the years he rose through the ranks and took over as Group Head – Purchase in 2009 and Sr. Vice President Supply Chain Management in 2014. Prior to joining Narayana Health, Dr. Milind worked as Consultant - Operations at Hosmac India – a healthcare consultancy company. He holds a Bachelor’s degree in Homoeopathic Medicine and Surgery and has completed his Masters in Hospital Administration from Tata Institute of Social Sciences.